Today’s technology is changing the way we do business at lightning speed. Social media commerce, too, moves at lightning speed, but by monitoring mentions and asking the community questions, you can get a pulse on how your market feels about upcoming changes. Others’ posts as well can help you assemble critical feedback from the public to help portend change and plan for upcoming seasons. Here are eight quick ways to leverage your social media audience and get to the heart of the current trends that are currently affecting your customers (and your business). Crowdsourcing is a portmanteau, combining the words crowd (your online community) and sourcing for solutions. Crowdsourcing enables you to tap into the collective intelligence of others in your community. Those with the budget could hire an agency and run focus groups questioning actual customers. However, the people who actually purchase your product or services have a keen sense of what they want, and their advice is better than any research from a high-priced agency. Crowdsourcing though social media allows you to drive business-related decisions based on stated customer needs. Not surprisingly, due to Twitter’s fast-moving conversation, you can ask questions related to your products or services and get answers quickly. Posting questions to your followers — or even sending public questions directly to individuals — can elicit responses. Direct questions such as: “This holiday season, which is more important to you? Free shipping or Quick shipping?” generally net straight responses. That question was tested in the figure, and within ten minutes more than 20 answers appeared. A few responses to a question posed on Twitter. 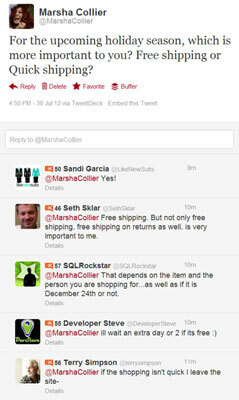 Sending questions in the form of direct messages can often be misconstrued as spamming. People on Twitter (especially the more connected users) are touchy about the type of message they receive in private messaging. Transparency is pivotal in social media, so keep your queries in open view. 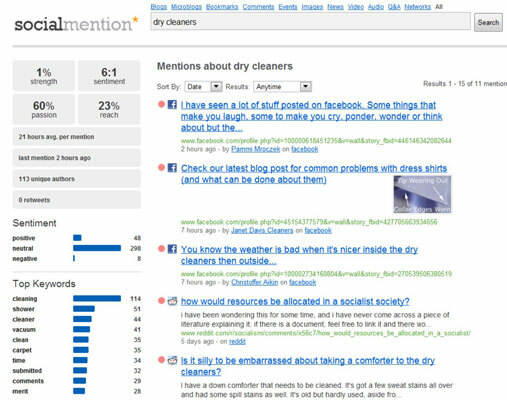 Social Mention can be used to monitor not only trends in your industry but also public sentiment. For example, someone who owns a dry cleaning business would search for dry cleaners on the site. That search showed recent posts from around the web from 113 unique authors. You can click to view each post individually, or pay more attention to the top keywords and sentiment ratings. From the Sentiment box on the left, you can see that people are fairly neutral. But if you click the word Negative, you can view only negative posts, as shown. Use this research to get ideas for improving your business. Few things get a person’s dander up about dry cleaners. Install a community platform on your site, if regular feedback is important to you. The free app from Wufoo can be used to poll your visitors on specific questions. Keep in mind that the folks who visit your site are there because they love your product or are attracted by your content’s personal slant. These people will more than likely want to participate. Take advantage of their loyalty. Your regular customers may understand your products as well as you do and have some great insights. Many applications are designed to install polls or surveys on your website. Surveys allow you to ask multiple questions of the participants. Many people like Polldaddy because of their ease of use and the fact that they offer a small account at no charge. They also have an iPhone and iPad app that can be used live at trade shows or on-demand in-person surveys. Their customized survey builder allows you to put in your own queries, add pictures, and choose from a group of templates to best match your site or blog’s design. After you’ve launched your poll or survey, your Polldaddy dashboard builds your reports in real time as your customers answer. When asking a customer to participate in a survey (which involves more time than a poll), qualify the customer in advance and then offer those who participate a bonus, such as a gift card. A face-to face focus group to gather opinions from consumers might sound old-school, but it could be a good idea. You can easily create a focus group through video chat. Solicit participants from your e-mail list, or ask for volunteers on your site or from your social media accounts. In a video chat, you can show products, perhaps ask questions about product styling, and take a more visual approach to your crowdsourcing. You also get to see the expressions on your panel’s faces when you ask and answer questions. By using Google+ video hangouts, you can gather a group of up to nine participants. Another good alternative is to use free Skype video calls. A maximum of ten people can join in, although Skype recommends no more than five for the best quality. Continuing the video topic, you could record a video asking consumers questions, and then post the video to YouTube. YouTube allows viewers to post video responses as well as text comments. You might just get an idea from someone in a far-reaching part of the planet who is interested in your product or service. Keep in mind that when polling publicly through social media in any form, you might be telegraphing your next move to your competitors. Design your questions so that you get the information you need without exposing your strategy. LinkedIn is the largest business network in the world, and many of the smartest people in any industry are members. 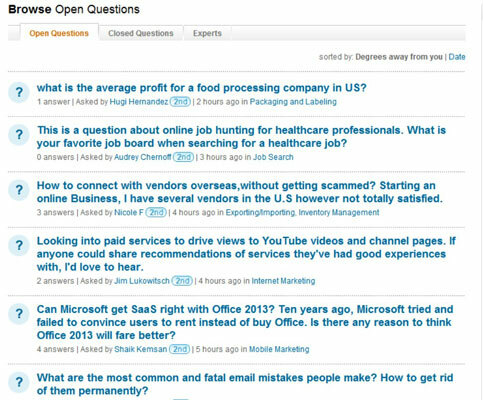 LinkedIn Answers, a little-known area of the site, is designed for businesspeople to pose questions to their connections and get feedback. Open questions in LinkedIn Answers. On this page, you can read questions and post your own. Although you may not get a response on LinkedIn as quickly as you do on Twitter, you are addressing a targeted audience of professionals on LinkedIn. Answering questions from other professionals in your industry is a great way to build new relationships.